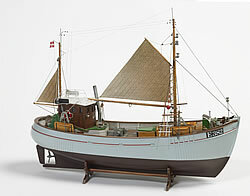 Billings Boats BIL472 Mary Ann-45 ton cutter 1/33 scale wood ship kit! The Mary Ann is the first model produced by Billing Boats in 1958. It has been modified 4 times during the years and changed names 3 times. The ship is a typical 45-ton cutter commonly seen in the harbour at Esbjerg, Denmark; often more than 600 cutters of this type can be seen at a time. The model kit is based on the original ship drawings.